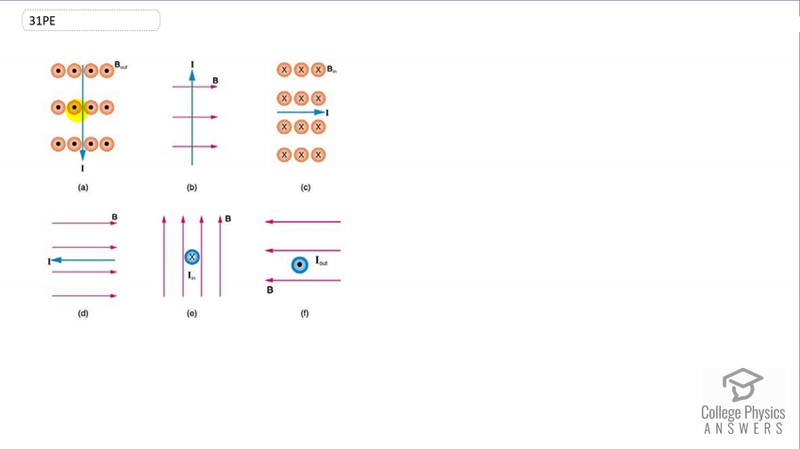 What is the direction of the magnetic force on the current in each of the six cases in Figure 22.59? Figure 22.59 Mangetic field lines and a current. This is College Physics Answers with Shaun Dychko. We'll use the Right Hand Rule to answer the question what direction the force will be on the current. So we point our thumb in the direction of the current and our fingers go in the direction of the magnetic field lines. And you can remember that this is how to do it because there's only one velocity or one current and you have only one thumb. And so that one thumb should go on the direction of the current. There are many magnetic field lines though, and so your many fingers point in the direction of those many magnetic field lines. And your palm is in the direction of the force. And the palm is to the left and so that's the direction of the force. Your thumb is pointing upwards in part b and your many fingers are pointing in the direction of the many magnetic field lines to the right and the palm is facing into the page. And so the force is directly into the page. And we draw exes which are like tail feathers of an arrow going away from you, that's the direction of the force into the page. In part c, the thumb goes to the right, the fingers go directly into the page and the palm is facing upwards. So you might say north or up is the direction of the force here. And in part d, because the current and the magnetic field lines are parallel there is no force in this picture. There's only a force if there's a component of the current that is perpendicular to the magnetic field lines and in this case there is none. In part e, your thumb points into the page along the in direction of the current, your fingers points upwards and then your palm is facing to the right. And so, the right hand shows this direction to the right. And if you're getting different answers by the way, make sure you're using the right hand and not the left hand. And then lastly, part f, the thumb is pointing out of the page, and the fingers are pointing to the left and the palm is facing down. And so the force there is down.